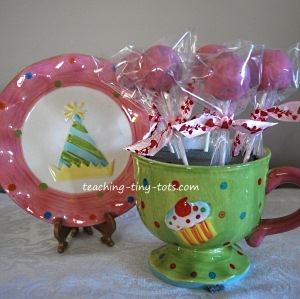 Using a red velvet cake mix and frosting, form balls, attach lollipop sticks and dip. 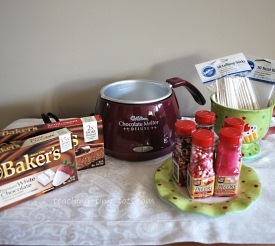 Add sprinkles if you desire and wrap in gift bag and ribbon. When the stick is firm and set, dip into chocolate and rotate until entire pop is covered and removed promptly. You can use a small spoon to cover areas missed but do NOT swirl pop in the chocolate or you will lose it. 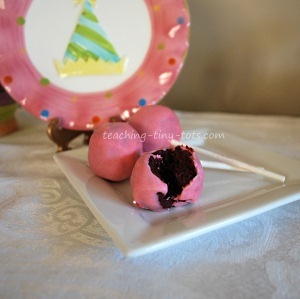 Gently tap the stick or your hand holding it and let cake pop drip the excess chocolate off. If you tap the stick too hard, your cake will fall off. Rotating the stick gently as you tap the stick will help make a smoother coating all around. Add sprinkles if desired and candy on top. Then while holding the lollipop stick, poke it into styrofoam block to set.